In early 1978, an extraordinary new invention for rock climbers was featured on the BBC television science show Tomorrow's World. It was called the 'Friend', and it not only made the sport safer, it helped push the limits of the possible. 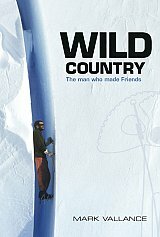 The company that made them was called Wild Country, the brainchild of Mark Vallance. Within six months, Vallance was selling Friends in sixteen countries. Wild Country would go on to develop much of the gear that transformed climbing in the 1980s. Mark Vallance's influence on the outdoor world extends far beyond the company he founded. He owned and opened the influential retailer Outside in the Peak District and was part of the team that built The Foundry, Sheffield's premier climbing wall - the first modern climbing gym in Britain. He worked for the Peak District National Park and served on its board. He even found time to climb 8,000-metre peaks and the Nose on El Capitan. Diagnosed with Parkinson's disease in his mid fifties and robbed of his plans for retirement, Vallance found a new sense of purpose as a reforming president of the British Mountaineering Council.